DYING to watch which is called Control. And it's this biopic film based on the life of the late Ian Curtis, lead singer of the legendary post-punk rock band Joy Division. Much of the screenplay is taken from the book, 'Touching from a Distance' which was written by Curtis' wife, Deborah. The story tells much about a biographical account of his marriage, detailing in part his infidelity, particularly with Belgian journalist Annik Honore, his tragic and troubled life during his life with the band Joy Division as well as his frequent epileptic seizures, which were thought to contribute to the circumstances that led to his suicide on the eve of Joy Division's first U.S. tour. I saw the trailer a couple of times and I thought that it was a must-see film; the story itself is sad and depressing and the thing that really grips you on your seat  is that it's all real. Ian Curtis was suffering from epilepsy, which when earlier, the people around him like his band mates weren't really informed about before. Eventually it came to everyone's knowledge, even the fans and he would often have onstage tonic-clonic seizures that resulted in unconsciousness and convulsions, or absence seizures that would cause brief trance-like pauses. There were times even, that he would just collapse onstage. While he was performing with the band, he would develop a kind of dancing style that resembles his epileptic seizure, which would soon lead to some confusion to his fans as to whether he was dancing or was just having a seizure. His last live performance was on May 2nd 1980 at Birmingham University which included Joy Division's first and last performance of the song "Ceremony", which was later used by New Order. Some of the things that people believed contributed to Curtis' suicide at the age of 23 were like the effects of his epilepsy and personal problems such as an impending divorce from his wife. The night Curtis died, the evening before Joy Division were to embark on their first American tour, Curtis returned to his home and convinced his wife, Deborah, to spend the evening at her parents' house. He watched one of his favourite movies, Stroszek by Werner Herzog and later hanged himself with a clothesline in his kitchen while reportedly listening to Iggy Pop's The Idiot. On top of the LP cover was a small cut out photograph of a moon struck dying sky taken by artist David Horvitz. Deborah found him the following morning. The film is being shot in black and white to "reflect the atmosphere of Joy Division and the mood of the era." 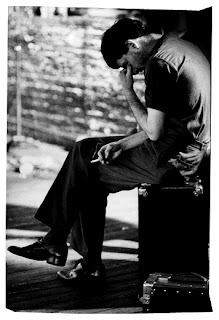 According to Anton Corbijn also, the reason as to why he did it in black and white was because it was the only way we've always remembered the band Joy Division; in black and white. I thought that it was a genius idea and really helped the movie. 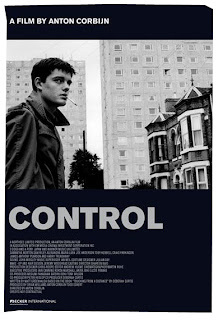 Anton Corbijn was approved by all Joy Division's fan to become the director of its film because he wasn't one of those directors (this I read in one of the YouTube comments) that would hire Jude Law to take the leading role. Originally a photographer, he was a devout fan of the band and even moved to the UK in 1979 from Holland in order to be nearer to his heroes. The story is sad, tragic and depressing, therefore I MUST watch this film. It would get me depressed for at least a week. No sign of it ever being released here, but we all have our sources. Meanwhile some songs that would bring us back to those great but depressing days.